The electromagnetic field (EMF) tester PCE-MFM 3000 is suitable for measurements in static and dynamic fields. Therefore, the electromagnetic field tester is ideal for checking magnetic valves or relays. The electromagnetic field (EMF) tester PCE-MFM 3000 is especially important in the industrial sector because there should be a control of whether a valve works properly or whether a relay switches. The electromagnetic field (EMF) tester PCE-MFM 3000 measures the magnetic field created through the housing. There is no need to open the housing and the function can be analysed very quickly and accurately. Due to the fact that the probe tip is flat, the outer probe of the electromagnetic field tester can be used in small gaps. This is very convenient while measuring air-core transformers. The electromagnetic field (EMF) tester also serves to explain and demonstrate the behavior of a magnetic field, because due to the numeric indication, an increase or decrease in field strength can be very well detected. 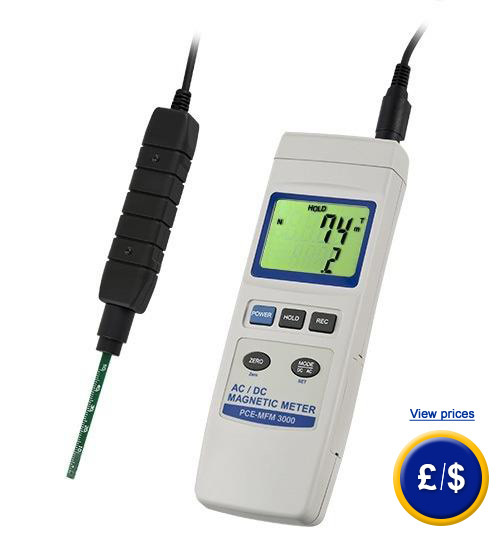 With small measuring ranges this tester is very well equipped to measure small magnetic fields safely, especially button magnets or magnetic guides which have a very weak magnetic field that can be detected easily by this meter. If there are any questions about this electromagnetic field tester PCE-MFM 3000, please have a look at the technical specification below or call: UK customers +44(0) 23 809 870 30 / US customers +1-410-387-7703. Our engineers and technicians will gladly advise you regarding the electromagnetic testers or any other products in terms of regulation and control, or scales and balances of PCE Instruments. 0 ... +50 °C/max. 85 % R.H.
for companies that wish to include this device in their set of internal testing tools or for annual recalibrations. The ISO certificate includes a laboratory calibration and a control document with all the measurement values. Please note: The ISO calibration is only valid with the sensor from the factory. In case you have to change the sensor, you must resend the equipment to be calibrated according to ISO standards. By default the RS-232 data cable is sent with the software package. If you want to transmit data to a laptop or other mobile storage medium, you need this USB adapter (driver software included). .
A constant power prevents failure in measurements caused by the low battery voltage. The network component serves only for power, not to charge the battery or batteries. We recommend the network component for long measurements.